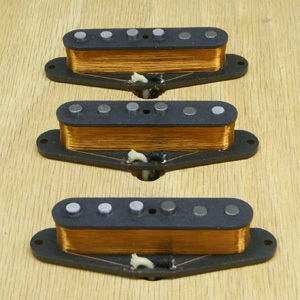 1962 EPIC SERIES Stratocaster Pickup Set Authentic in Every Way, including Original Alloy Magnets. 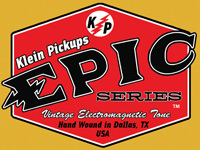 - Our Epic Series 1962 Pickups useOriginal Alloy Alnico 5. We've done it again, sent Original magnets to anIndependent Laboratory for Metallurgical Chemical Analysis Testing. Wethen contracted direct with our magnet manufacturer to get the Alnico 5 magnetsSpecially Poured to the exact composition of the Original 1962's. We are theonly manufacturer who offers this. Pure, Sweet, and Authentic Tone. - Our 42ga Heavy Formvar wire is not just stock wire. We have sent dozens of samples of wire from early stratocasters for analysis. We get our 42ga Heavy Formvar built to the exact specs of the samples we have had analyzed. Exact Resistance, Exact ID & OD, & Color matching. -Tone, the low end on these pickups are unprecedented, full of low end chunkiness, paired with a very nice medium output, brings out a perfect balance to the mid range drive in these pickups. They have just the right amount of bark in the mids, clean when strummed politely while driving when played more aggressively . The top end clarity present and very well balanced. Overall, these are a medium output set that can drive and bark when needed. -Compression, these pickups are medium in output so they will have a solid mid range presence. They will drive when needed or run warm and full when left clean. - This set is made to replicate original fender 1962 pickups, in look, tone, and feel. Exact magnetic field flux strength of the pickup and the exact stagger is used in it's construction. Cast Alnico 5 magnets, each holds the same magnetic charge as taken from the Original 1962 set. Once the pickup is wound we lightly wax pot (FLASH POT) them to avoid unwanted microphonic feedback but still retains that natural vintage tone. These are the most authentic and reasonably priced 1962 stratocaster vintage replacement pickups on the market.